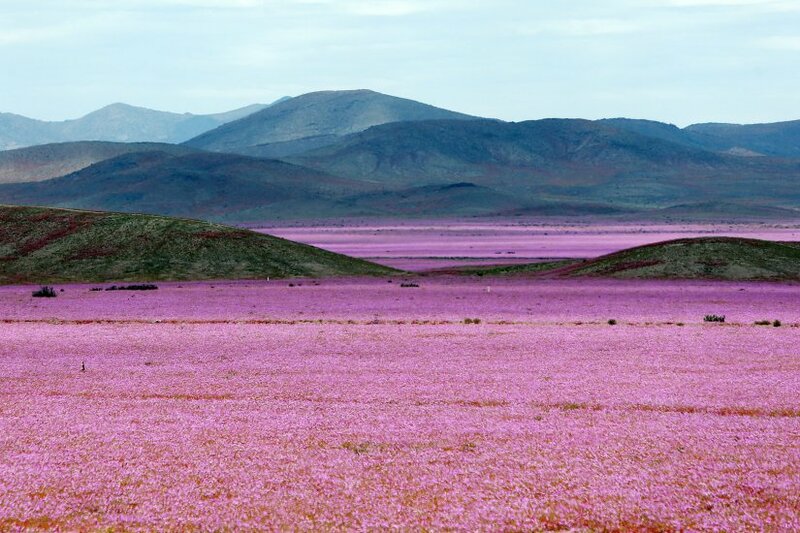 The desert in bloom, is one of the most strange but spectacular natural events in Chile, specifically in the Atacama Desert, ranked as the driest place in the World. Characterized by the massive flowering of a great diversity of species of native and endemic flora, which happens every five to seven years between the months of September to November, triggered by unusual rainfall associated with the occurrence of El Niño episodes. This condition is given especially South of the Tropic of Capricorn, the flowering desert can be seen in all its splendor in the region extending from north of Vallenar to Copiapo. When this occurs, since the rains have exceeded the normal levels, millions of seeds that were dormant due to little or no moisture germinate, together with a proliferation of birds, insects, lizards and rodents attracted by this true reawakening of Nature. By then, the sight of many areas of the Atacama Desert seem large agricultural plantations rather than a region of great aridity. It should be noted that in 2015, due to the intensification of El Niño, there was an exceptional occurrence of the flowering desert because it not only occurred in Spring between September and November, but also between April and May. Among the variety of flowers that carpet the desert during this period, the most representative is what locals call "Pata de Guanaco" (Guanaco's Foot, scientific name Calandrinia longiscapa), also the "Añañuca" (whose scientific term is Rhodophiala rhodolirion), the "Garra de Leon" (Bomarea ovallei), light blue and lilac "Suspiros", white and blue "Malvillas", "Orejas de Zorro", etc. Usually, the most privileged places to appreciate the phenomenon are the Parque Nacional LLanos de Challe, a protected natural area on the coast of the Third Region of Atacama and the Parque Nacional Pan de Azucar, located north of the city of Chañaral. A negative aspect, (as almost always), has been in charge of the human being. The number of visitors attracted by the spectacle and the illegal trade of flowers have endangered the regeneration of some species. However, it is good to know that for years the INIA (National Agricultural and Livestock Research Institute) through its Banco de Semillas (Seed Bank), is taking action to keep the seeds out of their natural environment, in botanical gardens to ensure the survival of the species for term not less than 50 years, among other facilities consist of a storage chamber at -18 ° C and 35% RH. The nearest and most important city is Copiapo, 800 km. N. of Santiago, a city of mining tradition but where there are some tour agencies whith departures to see the Desierto Florido (The Flowering Desert) when the conditions are given. The tour can also start in the city of La Serena, 465 km. from Santiago, following the Pan American Highway (Ruta 5) heading north. Soon I will be publishing a list of tour operators offering travels to see the spectacle.